A Southampton research study into waste management has received a prestigious national award. The project, looking at how small and large companies comply with waste regulations, has been selected by the Chartered Institution of Wastes Management (CIWM) for its annual Waste Regulation Award 2010. The award is given each year to the authors of the best paper on a waste regulation topic written or presented in the last year. This year three academics from the University of Southampton were named as recipients of the award. PhD student Chris Wilson; Ian Williams, Professor of Applied Environmental Science; and Simon Kemp, Director of Employability in Engineering and Environment; were recognised for their paper Compliance with Producer Responsibility Legislation: Experiences from UK Small and Medium-sized Enterprises (SMEs). Their work investigated the legal performance of 44 SMEs to see whether they complied with the legislation encouraging manufacturers to design environmentally-friendly products that can be reused, bought-back, recycled, or used in energy production at the end of their life. The report focused on packaging and packaging waste; waste electrical and electronic equipment; and the restriction of the use of certain hazardous substances in electrical and electronic equipment. Their findings suggested low levels of compliance by the SMEs and that enforcement and surveillance of this legislation was also generally low. Professor Ian Williams says: “Receiving this award is recognition of the hard work that Chris Wilson in particular has put into producing this report. 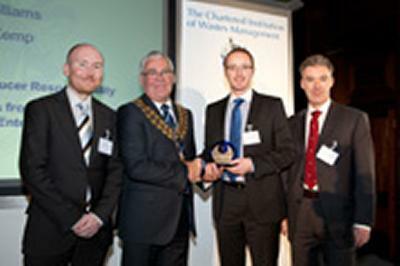 Ian, Simon and Chris received their award from CIWM President Derek Greedy at a special ceremony in London.